When the 11th Legislature convened in 1979, the Alaska petroleum industry was flourishing, with oil prices and state revenue soaring. 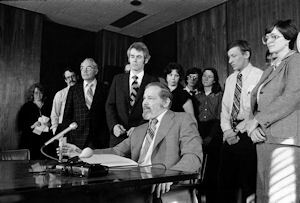 Voters had passed a constitutional amendment in 1976 to create a permanent fund, and the 11th Legislature established the framework for both the Alaska Permanent Fund Corporation (APFC) and the Permanent Fund Dividend (PFD) program. The 1980 Permanent Fund Act established the APFC to manage the fund and increased the oil revenue contribution rate from 25 to 50 percent. The original dividend program passed by the Legislature would have issued residents 18 or older dividends based on the length of residency in Alaska since statehood ($50 per year), either in monthly or annual payments. The 11th Legislature repealed the individual state income tax, provided tax refunds to individuals, and increased the longevity bonus (for Alaskans over 65 who have lived in the state since 1959) to $200 per month. The Legislature also increased the number of superior court judges and established the Court of Appeals. At the federal level, in 1980 Congress passed the Alaska National Interest Lands Conservation Act (ANILCA), protecting over 100 million acres of land in Alaska, creating ten new national parks, and establishing many environmental and developmental regulations on these federal lands. The 1,000th tanker leaves Valdez. Having doubled in one year, income from petroleum now represents 73 percent of unrestricted general fund revenue, which exceeds $1 billion for the first time. The federal government files suit to claim submerged lands, known as Dinkum Sands, in the Beaufort Sea. The nuclear reactor at Three Mile Island in Pennsylvania experiences a core meltdown, catching federal and state authorities off-guard. The Iranian hostage crisis begins.